Is there a better alternative to Galleried? Is Galleried really the best app in Illustration category? Will Galleried work good on macOS 10.13.4? Galleried features Web designs from hand-picked galleries in a fast, easy-to-browse interface. Get inspired wherever you are, whenever you need. Get a lot of inspiration in a little time with our fast tiled thumbnails interface. Click a tile to see a larger preview, then open the Web site or view the gallery posting. Click the heart to favorite a design. In the browse view, click the heart to show a list of all your favorited sites. Galleried needs a rating. Be the first to rate this app and get the discussion started! Use Dropbox? Sync your favorite sites to your other Macs or to Galleried for iOS via Dropbox. 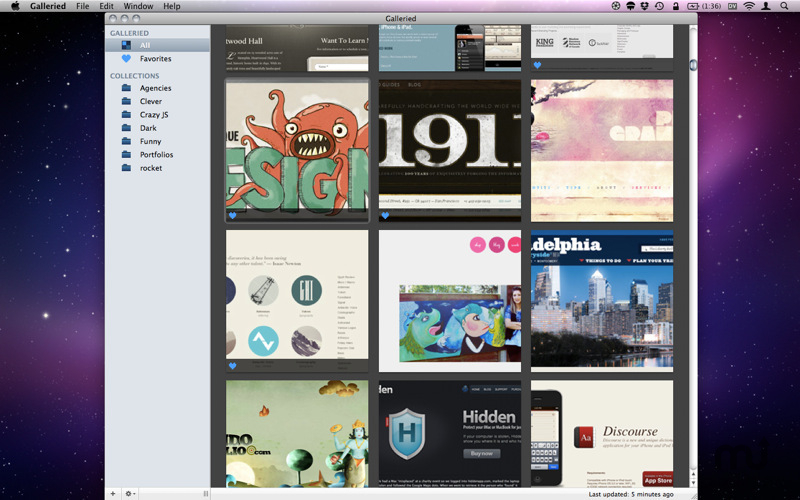 Galleried shows sites featured on hand-picked galleries like CSS Mania, Creattica, Folio Focus, App Sites and more.